At the McDonald Farm, Beatty’s brigade pushes back Breckinridge’s skirmishers. 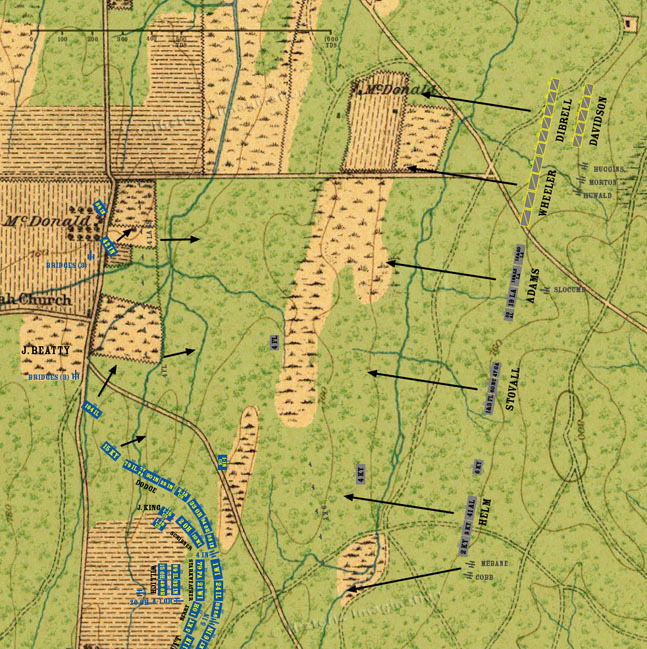 Unfortunately, the stubborn resistance from the Confederate skirmishers, plus the distance Beatty is supposed to cover, results in the individual regiments of the brigade breaking contact with each other. In addition, half of Bridge’s battery takes up a position at the intersection of the Lafayette and Alexander Bridge Roads, while the other half continues north with the 42nd and 88th Indiana. Dodge’s brigade comes on line to the left of John King’s Regular brigade. Unknown to Beatty, in the forest to the east the Confederate attack has finally begun. Breckinridge’s Division steps off to attack, with Forrest’s cavalry screening him to the north.